Three giraffes and a white rhino laze in the Serengeti National Park in Tanzania in 2012. The global giraffe population has dropped sharply in recent decades, prompting wildlife groups to urge the giraffe's addition to the endangered species list. With its spindly legs, distinctive patterning, and absurdly long neck, the giraffe makes a compelling figure on the savanna. But the population of the world&apos;s tallest mammal has dropped sharply in recent decades – from about 150,000 in 1985, to fewer than 100,000 today. That decline prompted five wildlife groups to petition the U.S. Fish and Wildlife Service on Wednesday to classify the giraffe as an endangered species. They say the giraffe is facing increasing threats from habitat loss, illegal hunting for bush meat and an international trade in trophies and bone carvings. Giraffes aren&apos;t native to the U.S., but FWS classifies foreign species, too. 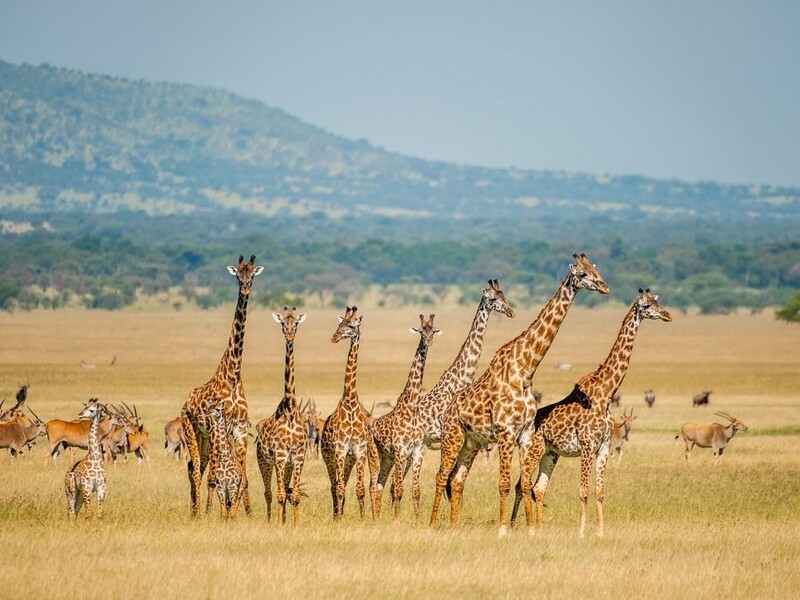 There are a few ways the U.S. classification could help the giraffe population rebound in Africa, says Jeffrey Flocken, regional director for International Fund for Animal Welfare, one of the groups behind the petition. He says that from 2006 to 2015, the U.S. was responsible for importing 3,744 giraffe hunting trophies. That&apos;s almost one per day. "The biggest reason to petition to list it under the U.S. Endangered Species Act," Flocken says, "is while we can&apos;t stop people from killing species in other countries, we can stop them bringing the parts back to the United States. So if this were successful, it would either limit or outright stop import of giraffe parts." In addition to limiting imports, Flocken notes that species classified as endangered or threatened under the Endangered Species Act get more attention – and greater opportunities for funding to monitor and protect the species. "It&apos;s a bit of a Catch-22," says Flocken. "Until a species is declared imperiled — either endangered or threatened — there isn&apos;t much recording and monitoring done of what is going on with that species. There could be scientists studying their biology and their life in the wild, but at the same time perhaps no one is monitoring their trade." FWS would not comment or confirm receipt of the petition, but its website explains its process for petition review. Once a petition is received, the FWS (or the National Marine Fisheries Service for most marine species) makes a determination within 90 days as to whether there is "substantial information" that the potential listing may be warranted. "By regulating activities, the United States ensures that people under the jurisdiction of the United States do not contribute to the further decline of listed species," it says. The petition — and the giraffe&apos;s prospects — may benefit from the popularity the species enjoys among the general public. "If you ask any random group of folks here in the U.S. what their favorite animal is, ultimately giraffes are going to be in the top five," Flocken says. "People love them. And I think the new knowledge that they&apos;re in trouble is going to surprise many individuals, and I think there will be a movement in the conservation community and the general public to help save them."